Every week we gather around a single word and write our hearts out for five minutes flat. Then we share our words and click around the link-up to meet new blogging friends, catch up with old ones, and spread the encouragement far and wide. Sound like fun? Learn more about how the link-up works by clicking here. 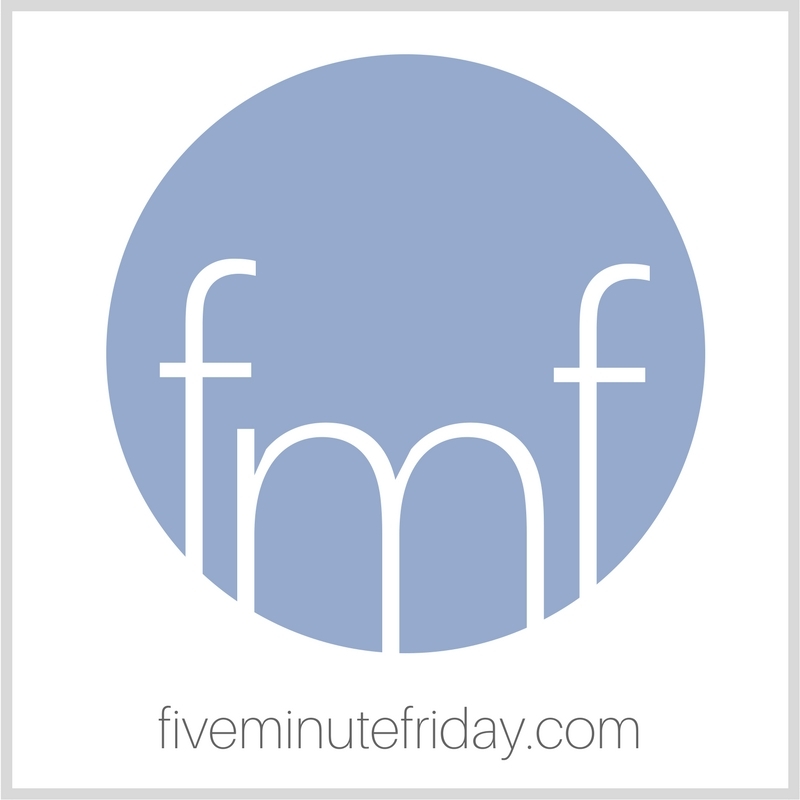 Join @5minutefriday as we write for five minutes on the prompt, SILENCE. I work full-time from home, and often I’ll do a load (or four) of laundry during the day while I work. As my fingers clack away at my keyboard, the washing machine churns and swishes and chugs along, doing what it’s supposed to do. I don’t always notice it, until it stops. And every time the machine stops, I subconsciously sigh in relief: Phew. That obnoxious noise is gone. I didn’t even realize how much the sound of the washing machine grates on me, raises my tension level, and hinders my concentration until it’s gone. A friend recently challenged me to sit in stillness with God. She pointed out the fact that in general as a society, we are not good at being still. I’ll be the first to raise my hand in that confession. I decided to take on the challenge — and I’m embarrassed to admit how difficult it was to be still. I wanted to be doing something, reading something, typing something, fidgeting with something — even folding clean laundry. The difficulty of the challenge convicted me. Without the practice of stillness and silence before the Lord, how will I hear Him? How will I receive His guidance and direction and wisdom that I ask Him for, if I’m not quiet enough or patient enough to wait for His response? And what’s just as scary — am I even noticing how much the noise of daily life is hindering my focus and elevating my tension? Like my reaction to the washing machine, do I even realize how much the busyness and demands of a full schedule are negatively impacting my receptiveness to the Lord? A Challenge for You: Take five minutes to be silent before the Lord today. Link up your own five minute free write below, then visit your link-up neighbor to leave an encouraging comment! That was an interesting question, “if it were cheating to have a pen handy?”. I have started to journal my prayers. Then I sit in silence. With my pen handy. Because God is answering them and I have to write down what He is saying. Because it blows my mind what He has been telling me. So YES keep your pen handy. God likes conversation. You speak. But then give Him time to talk while you listen. Blessings on you as you work through this. If you are interested in more of this type of talking to God, I do have a private group called Growing Through God’s Word. We would welcome you. I often journal my prayers in silence, not cheating in my opinion. It helps me focus and it also gives me a record of what I’ve prayed about. It truly is hard to be still. I need to be better about being still too. Interesting, for me. Our refrigerator has a dying evap fan; I have a replacement but need to coordinate with Barb’s schedule to unload the freezer and change out the fan. I can no longer do this alone. Meanwhile, when the fan is running, it makes a hectic grinding noise, that means that all is well…it’s working. When it stops, I have to tap the back wall of the freezer with a hammer-handle. If the fan starts up, it was supposed to keep going. If it doesn’t, it means that the thermometer decided to let it rest. The loud grating sound of the fan is music to my ears. Everything’s working; all is OK.
Good word choice, Kate – stirred a memory. Thanks! Woah. I needed those words. I have a day of “forced vacation” from work. I’m hoping to talk to God a little more today. Thank you. Love this! Can’t wait to get busy writing. Hmmm this makes me wonder if the background noises are actually negatively affecting my silence. Thanks for hosting. It is hard to be still and wait and listen only. I love silence but just waiting and listening is impossible. Silence and His Word, silence and a journal where I pour out my heart, that allows me to hear Him as my mind and heart are fixed only on Him. My life has been nothing but chaos the last few months. But the verse God continues to give me is be still and know that I am God. I know God is calling me to something new I don’t know when I don’t know how I know I have to find time to be silent and hear his voice. Silence doesn’t come naturally. I always feel like I have to be thinking about the next thing to do. If we don’t set aside time to be silent before the Lord. He will get our attention somehow and then all we will want to do. Is run to him in Desperation and have that silent time with him. I read today that I need to stop telling God what I want and seek Him to find out what He wants. Sitting in silence, which is very difficult for me, helped me rest in the fact that He is in charge. Not me. Breathing easier now knowing that I don’t have to “do” anything but when He calls I will be ready to move. Praying for you that you can breathe in His Spirit today. I love this post today. Silence is so important or how are we going to hear from God. We talk and talk. But do we listen to Him. And noise around us can raise the tension in our bodies. Praying that you can continue this practice of listening. Blessings and thanks for the Friday linkup. I’m the exact same way. Much as I love and even crave silence, there’s always some chore that needs tending to. The laundry and the dishes. So much noise. And like you, I don’t even realize that all the commotion makes me tense until I breathe out a long sigh when the cycles and the chugging stop. I need that challenge. I need to truly be still. So true, we don’t know the noise is going on till it stops. We are tuned into cacophony. Stillness is foreign, even though for a moment we are relieved. I like yiur thoughts and will take on your challenge. #79.
time I have left on His earth, before my soul enters His heaven.